Large range of packing material to suit your needs. First time renter, awesome customer service, friendly and easy to talk to. Clean and tidy facility, Free rental truck with unit and everything needed (trolley, lift etc) is there for usage. Secure facility. Thanks Rob!!! Thanks for the great review, Lavinia. It was a pleasure serving you as a customer. Very friendly customer service, clean and tidy facility. Great storage facility. Friendly, helpful customer service. Free removal truck with storage unit. Everything you need to move in and out quick and easy, with trolleys and a lift supplied. Great experience thanks to Rob. Great customer service made the process of organizing storage super easy, highly recommend! Rob was friendly and very helpful at what is normally a stressful time, moving. Being my first time using storage Rob took us step by step through the process making it easy. I would definitely recommend here as the place to go. Thanks Rob. Very helpful and friendly service. Nice clean facility with 24 hour access. Clean, lighting is good, cameras to monitor, has easy access for clients but not intruders. Absolutely top blokes! Couldn't recommend this place enough. Customer service has always been lovely, their top priority is helping the customer out and I'm almost sad that I have to move my stuff out. Just an all round great place. Rob & Peter provided an excellent service for a short term stay, would have no hesitation in recommending their facility. Thanks Gents. Easy location. Clean, tidy and secure. Staff are very helpful and friendly, besides one of the security guards who's a grumpy old bloke who loves a good whinge. Guys these peeps have been amazing to us!!!! Thanks for taking such good care of us rob!!!! Robert is great! I had been talking to him for a while and he made choosing a unit so much easier! Great customer service and very helpful! Really excellent service! A tiring move interstate, chaotic removalists and more stuff than I ever thought I owned...all so easily accommodated by Rob. THANK YOU!!!!! Excellent service. Robert couldn't have been more helpful and accommodating. 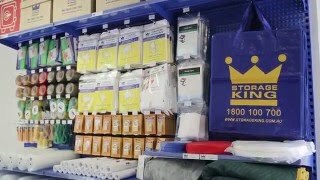 Storage King North Wyong proudly services Wyong, Wadalba, Hamlyn Terrace, Warnervale, Kanwal, Watanobbi, Wyongah, Tuggerawong, Rocky Point, Tacoma and Tuggerah.